B was admitted to the Friends Stroke Unit at Kings College Hospital at 4am. This was because he was at risk of stroke, but he was the only person I could see who hadn’t already had one. The name of the unit seemed a bit cruel to me – these poor people either didn’t seem to have any friends or couldn’t remember who they were. The unit has a rule that all patients must lie flat for the first 24 hours. This makes sense for those who had HAD a stroke but rules are rules so B had to comply. He found it quite hard to conduct a conversation with anyone whilst flat out. In the morning B received some further bad news – his carotid artery lining was ruptured in not one, but three, places. Then another bombshell – the specialists suspect that he has Marfan Syndrome, a genetic abnormality that causes weakened blood vessels. B displays all of these signs. I’m sure that in today’s world he would have been checked for this syndrome as a child, but I’m not surprised that doctors in 1970s rural Germany missed it. It involves the mutation of a gene responsible for the production of connective tissue. B’s blood has been sent off to be tested, but the results will take 2-3 months to come back. The affected gene can mutate in more than 3,000 ways which makes diagnosis difficult. Celebrity sufferers include swimmer Michael Phelps and (apparently) Abraham Lincoln and Osama Bin Laden. People have obviously taken a guess about the last 2 based on their physical features. I’m sure Osama was too busy heading up al-Qaeda and plotting the downfall of the west to be genetically tested. I doubt he’d signed up for the Marfan Foundation newsletter. Because of all this I started thinking about my own physical features (yes, it’s all about me). Maybe there’s a whole tribe of short, freckled people with dodgy skin and feet out there? 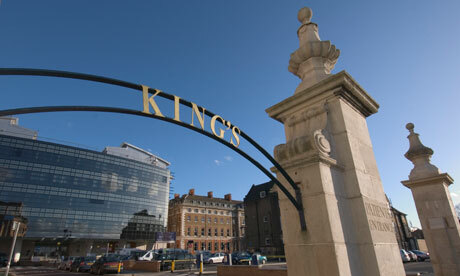 The above revelations caused quite a stir at King’s College which is a teaching hospital. B was visited, prodded, measured and photographed by various groups of students. He was glad that the physical signs didn’t affect his privates, or I’m sure he would have been asked to whip them out for repeated inspection as well. I tried several times during the day to get B moved to the Guthrie Wing which is the private wing of the hospital. The reception I received was quite hostile. I was told that the wing is ‘mainly post-surgical’ even though he’s stayed there before after he had his first seizure. When I called again later the person processing his application had left for the day. I was told that nobody else could pick it up. Hospital administration at its very best. It left me wondering what is the point of having private health insurance? B could have been utilising a bed there, freeing up a spot in the stroke unit for someone who had actually had a stroke. Love you Jilly. You have sucha way with words.